Introduction: Quercetin (QUER) is a bioactive phytochemical belonging to a large group of polyphenolic flavonoid substances and one of the most abundant flavonoids in the human diet. 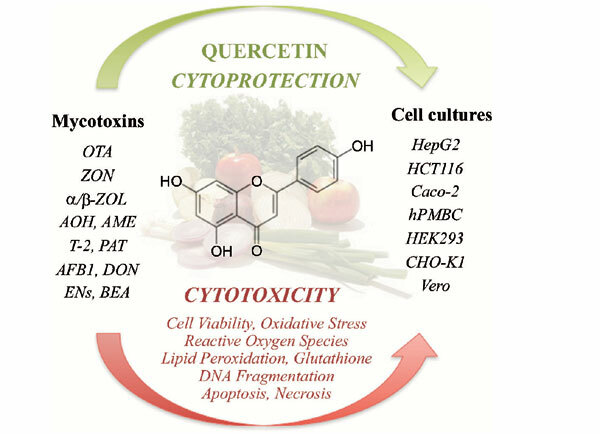 The antioxidant and pro-oxidant activity of QUER has been extensively investigated because of contradictory findings about its ability to protect mammalian cells from cytotoxicity. QUER is concomitant with mycotoxins in numerous food and foodstuffs. In the 80s, experimental approaches started to evaluate in vitro its protective effects against cytotoxicity related to mycotoxin ingest. Objective: The aim of this mini-review was to analyze how QUER treatment modifies mycotoxin effects in in vitro experimental models. Methods: A literature research was performed using the keyword “quercetin”, “mycotoxin” and “in vitro”, individually or all together, in Scopus, Web of Science and Pubmed. Results: In literature, the tested mycotoxins are described as follows: ochratoxin A, zearalenone and its metabolites α- and β-zearalenol, alternariol, alternariol monomethyl ether, T-2 toxin, patulin, aflatoxin B-1, deoxynivalenol, enniatins and beauvericin. Regarding the experimental models, human hepatocellular (HepG2) and colorectal carcinoma (HCT116 and Caco-2), human peripheral blood mononuclear cells (hPMBC), embryonic kidney (HEK293), Chinese hamster ovary (CHO-K1) and African green monkey kidney (Vero) cell lines were used. Conclusion: QUER showed promising results that made researchers move up to in vivo experiments. As future implementation, a combination of dietary non-enzymatic antioxidant products in food and feed could reduce the effects of mycotoxins on humans and animals. Keywords: Antioxidant, cytotoxicity, in vitro, mycotoxins, polyphenol, quercetin. Keywords:Antioxidant, cytotoxicity, in vitro, mycotoxins, polyphenol, quercetin. Abstract:Introduction: Quercetin (QUER) is a bioactive phytochemical belonging to a large group of polyphenolic flavonoid substances and one of the most abundant flavonoids in the human diet. The antioxidant and pro-oxidant activity of QUER has been extensively investigated because of contradictory findings about its ability to protect mammalian cells from cytotoxicity. QUER is concomitant with mycotoxins in numerous food and foodstuffs. In the 80s, experimental approaches started to evaluate in vitro its protective effects against cytotoxicity related to mycotoxin ingest.